Kawasaki’s ZX-6R Ninja has always been one of the most popular bikes in this 600cc middleweight class and has always been rated a great all-rounder. With the introduction of the 2001 model not too much has changed in that regard. 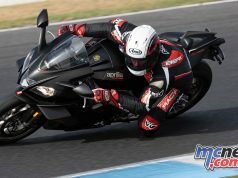 The SuperSport Ninja handles quite well but the bike does get better with a little fettling to your tastes. My first move would be to raise the rear ride height a little which the Kawasaki easily accommodates as it comes with adjustable ride height. The next spanner would add a little more compression damping at the rear. 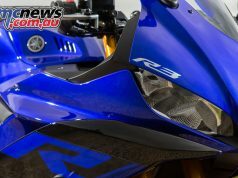 I do prefer the Ninja’s confident handling over Yamaha’s R6 but feel that it does fall a bit behind Suzuki’s GSX-R 600 and Honda’s new perfectly balanced (but needing a little more clearance) CBR 600 F4i. Some of you will be surprised at my rating the Ninja ahead of the R6 in the handling department but I honestly feel that 95% of riders would be a lot more comfortable with the balance of the Ninja over the Yamaha. Racers of course completely modify suspension so race results should not be the measuring stick to rate these road bikes. However you do feel the extra few kilograms that the Kawasaki carries over the opposition, wet weights with full tanks are as follows. I think the more upright riding position that the ZX-6R possesses maybe amplifies this difference more than it would if the seating position was more aggressive. The 600cc engine could be a little more refined and the unit we tested did need a little sorting in the carburation department. Performance is good though and the bike can crack 11-second quarter miles with ease. The ZX-6R still uses carbs and a reserve switch rather than the warning light and automatic reserve that most new bikes are equipped with. A drawback of the carb’ system is that the Kawasaki is a bit hard to get up to operating temperature on those cold mornings. However I must say that as the ZX-6R got more miles under its belt this did improve somewhat. Kawasaki recommends the use of premium unleaded only. Braking is one of the Kawasaki’s strong suits with excellent power from 6-piston calipers and 300mm discs. A little fade could be felt on repeated hard stops but switching to a different compound pad would probably fix that. Changing gears through the 6-speed box is a pleasant enough experience and the transmission is mated to a progressive clutch that has plenty of feel through the lever to help with those fast getaways. The bike does have a slight tendency to drop out of gear which means you do have to be deliberate with your shifts. 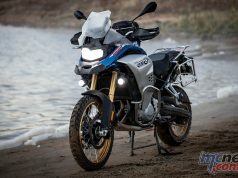 A superior tank range, I saw 350 kilometres between fill-ups at one stage, and the ease with which the Kawasaki can be loaded up with gear via the excellent under seat luggage hooks put it ahead of the competition in the touring arena. Ergonomics are also very user friendly with a comfortable and well padded seat and reasonable reach to the bars. A little more legroom would not go astray on long trips but it is no worse in this regard than the competition. I covered well over 2,000 kilometres on the ZX-6R during our short time together and never found myself feeling too uncomfortable. Pillion accommodation is the best in the class with excellent grab handles and reasonable legroom for your passenger. It is a bit unusual these days to be on a bike that uses a conventional needle/dial style speedo’ rather than a digital LCD display. Which style you prefer is a personal decision but the LCD displays do give you a more accurate reading than a graduated dial, which helps to stick to those suburban speed limits. Fuel Injection, a more modern dash layout and the loss of a few kilos would be all it would take to put the Kwaka’ very near the front of this class and in my book it does need those updates. However the ZX-6R costs a little less than the opposition and the comfort may win your heart over it’s rivals. 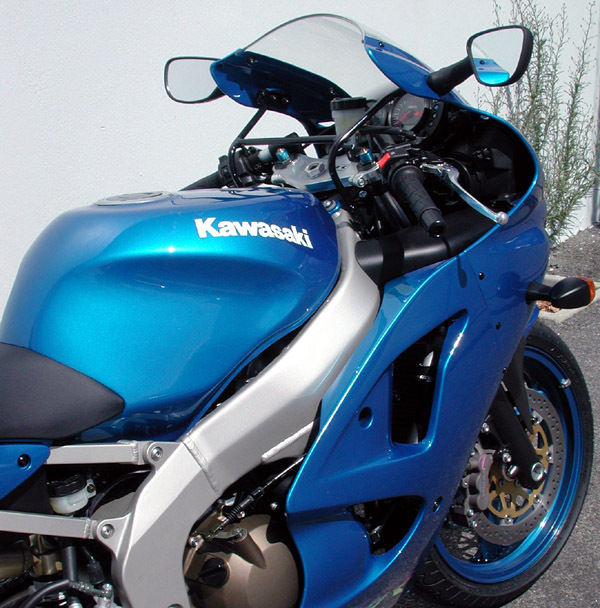 The lack of graphics on the 2002 model is a refreshing change and gives the bike a classy look, especially in the fantastic blue that Kawasaki offers. $13,490 + on road costs will get you one.